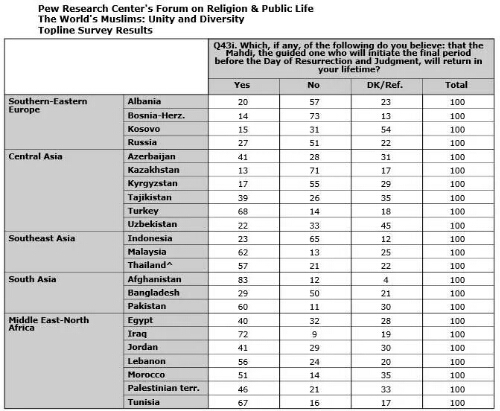 Pew Forum on Religion and Public Life released a study in 2012 on beliefs and attitudes in the Islamic world, entitled “The World’s Muslims: Unity and Diversity” surveying over 28,000 Muslims in 24 countries. 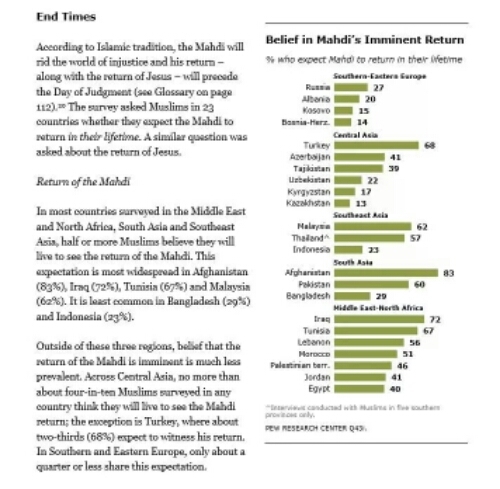 The study reveals in South Asia, Southeast Asia and the Middle East and North Africa, clear majorities of Muslims expect the Mahdi’s coming in the next few decades. Almost a third in Central Asia do so, as well. Only in Southern and Eastern Europe is the figure below 20 percent. Looking at specific countries, the highest percentage of the population expecting the Mahdi’s near-term appearance is found in Afghanistan (83 percent), followed by Iraq (72 percent), Turkey (68 percent) and Tunisia (67 percent). Sixty percent of Pakistanis, 51 percent of Moroccans, 46 percent of Palestinians and 40 percent of Egyptians are looking for the Mahdi in their lifetimes. The average for the 23 countries Pew surveyed on this issue of Mahdi comes out to 42 percent, and extrapolating from that to the entire Muslim world means there are over 670 million Muslims who believe the Mahdi will appear here in the first half of the twenty-first century. Furthermore, according to Pew, an average of 35 percent of the Muslim population believes Jesus is coming back soon — with the strongest expectations in Tunisia (67 percent), Turkey (65 percent), Iraq (64 percent), Lebanon (52 percent) and among Thailand’s Muslims (51 percent). Pew included 16 sub-Saharan African countries in this survey question, as well as 23 in other parts of Eurasia. 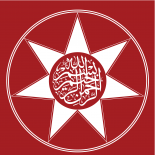 This entry was posted on April 15, 2014 by ASFC in Ahmed Amiruddin and tagged islam, Jesus, Mahdi, Muslims, Pew Forum on Religion and Public Life, Sayyid Ahmed Amiruddin, shaykh nazim.